The Hot Springs Village Breakfast Lions was chartered on March 21, 1977 with the sponsorship of the Hot Springs Village Evening Lions. We currently have about 56 members and meet twice monthly at the Townhouse Association Meeting Hall at 1 Perralena Lane in the Valencia Courts in Hot Springs village. We meet for breakfast on the first and third Thursdays of the month at 7:45am. 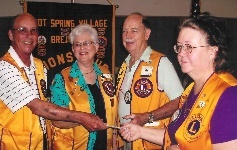 The Hot Springs Village Breakfast Lions Club is a community service organization that is part of the Arkansas Multiple District #7 which in turn is part of the Association of Lions Clubs International. Lions Clubs International has 1.5 million members in 210 countries and districts. This makes Lions Clubs International the largest service organization in the world. The Breakfast Lions subscribes to the Purpose, Ethics and Vision of the Lions Clubs International. The Association of International Lions Clubs logo has a history and symbolism that should be noted by all Lions clubs members. To take an active interest in the civic, cultural, social and moral welfare of our community. To unite the members in the bond of friendship, good fellowship and mutual understanding. Preschool Vision Screening for children ages 2 through 5 throughout Garland and surrounding counties to detect early vision problems. Two scholarships to the summer Blind Camp plus volunteer assistance at the camp. Active participation in the support of the daily activities of the summer Blind Camp at Yorkton Bay on Lake Ouchita. Support of the FOCUS program to help aging villagers with loss of eye sight. Sponsor of an International Peace Poster contest for 12 & 13 year old school children to create an artistic vision of international peace. World Services for the Blind: An organization in Little Rock that trains the blind or visually imparied to function independently, to live full, productive lives with dignity and self-respect. Arkansas Lions Eye Bank and Laboratory: An organization that helps restores vision through corneal transplants donated to provide sight to someone in need. Mid-South Sight and Hearing: Treats indigent patients from Arkansas, Mississippi, Missouri and Tennessee in an effort to preserve and restore their sight or hearing. Lions of Arkansas Foundation: Lions helping Arkansas Lions serve the needs of the state of Arkansas. Lions Club International Foundation: Lions helping Lions serve the world wide needs. Lions Leader Dog program in Rochester, Michigan. Annual Golf Tournament in October at one of the village courses. Chili Day and Silent Auction on the second Saturday in March at the Cornodo Center. White Cane Day: A once a year collection at the entrances of local businesses. Flag Sales: Installation of flag poles and flags for village residences.